Saturdays are very special, it’s time to count blessings! When trying to come up with a thankful list for the letter M, the thought came to me that each of us has many sides. It’s a good thing, it keeps us from getting boring. My nurturing side is strong, i have it to thank for all the care i have given to kids and cats over the years. There’s a shy side that i thank for helping me know when to step back. The bookworm side is always curious and never wants to quit learning. Angry-at-injustice side wants to keep fighting, even when the odds are not good. Part of me is grown up enough not to care much what other people think. While i’m not so sure what to call that side, i am thankful i have it. The romantic side is a big part of why i’ve been married over 30 years. Impatient side is learning to sit still, and i’m glad for the lessons i’ve learned when i’ve been able to control it. My critical/perfectionist side has taught me to strive to improve, even as i’ve had to tell that side that perfect is impossible and is the enemy of what is truly possible. The optimistic side keeps me from getting too bogged down for too long, even when things aren’t going as well as they could be. Fun-loving and joking side are the reason i can’t stop trying to be funny on Sunday. What sides of you do you like best? Everyone has reasons to be thankful. 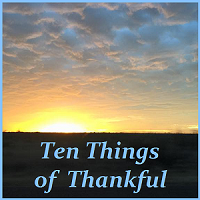 Why not list yours and link up with our hostess, Josie Two Shoes, at Ten Things of Thankful? We won’t fuss if it’s not ten things, the whole idea is to celebrate and be thankful with and for each other. Ex Spouse Day — why? I like the inside of me best, the side that nobody sees but me!